We just returned from a short stay in Venice, one of our favorite Italian cities. It is such a unique place, unlike any other city we have been to, which is why we are always drawn back. As well as the amazing architecture and stunning views, Venice is famous for its fresh seafood and on each trip we take there, we take full advantage of its seafood bounty. For the three days that we were away, we enjoyed seafood every day for both lunch and dinner, and on our departure day we visited the famous fish market behind the Rialto bridge to buy more seafood to take home with us. We actually discussed what our seafood purchases should be days before we even visited Venice, but since I am the one who prepares our meals, I had the final say. As well as octopus, scallops, and San Pietro fillets, I decided I wanted some fresh sardines to bring home to fry. We had seen sardines cooked in just about every fashion at the Venetian wine bars we had visited and not having cooked sardines very often myself, I wanted to give them a try at home. Sardines are a very popular fish in Venice and are served both as cichetti (finger foods) in the bacari (wine bars), as well as in sauces used to top pasta in restaurants. I had planned on buying whole fresh sardines and cleaning them myself at home which is a procedure I’ve yet to tackle, but both the fish monger and my husband talked me into buying them already cleaned since you could buy an entire sheet of cleaned sardines for just 5 euros. To fillet the fish yourself at home, first cut off the heads, and then cut a slit down the side to remove the spines and internal guts. 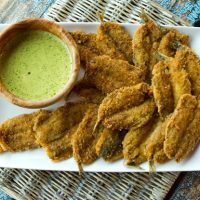 The sardines are sold opened like a book, and are often stuffed and fried, or left unstuffed and simply fried as I have in this recipe. 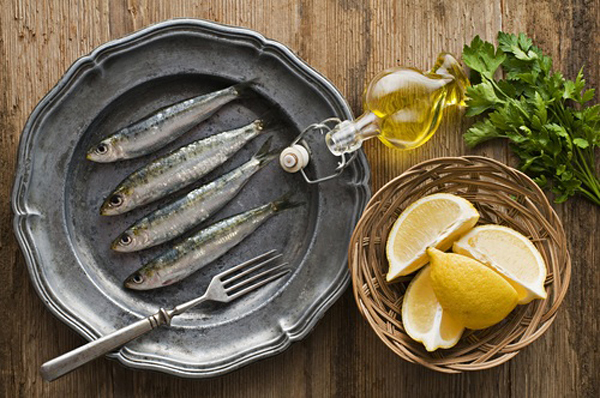 These sardines are delicious served simply with lemon wedges as they do in Venice, but I decided to make a piquant sauce or aioli to serve with mine. I use my hand blender to make most of these types of sauces as I can whip them up in just a few minutes. These sardines are delicious served warm or at room temperature. 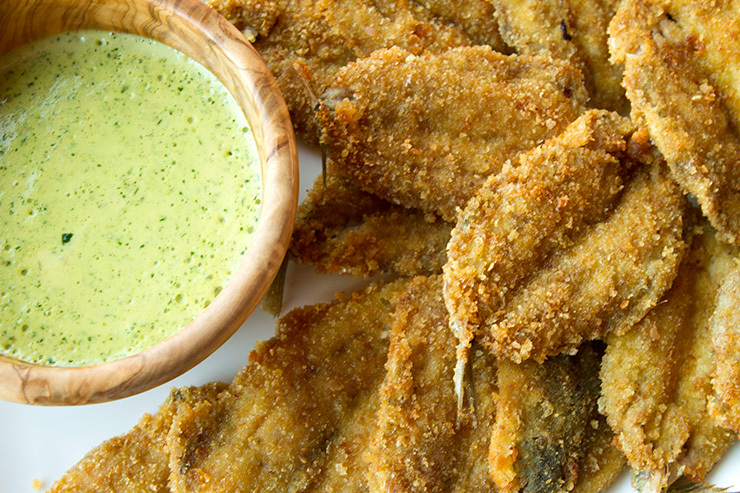 Quick fried breaded sardines are served with a zesty parsley sauce. To make the sauce, place the egg yolk, capers, and lemon juice in a small jar. Using a hand blender, pulse until smooth. Slowly begin to add the olive oil, pulsing as you go until you have a smooth, thick sauce. Pulse until the parsley is almost blended but flecks are still showing. If the sauce is too thick, season with a little lemon juice or water, then store in a covered bowl in the refrigerator until needed. Rinse the sardines and pat dry. 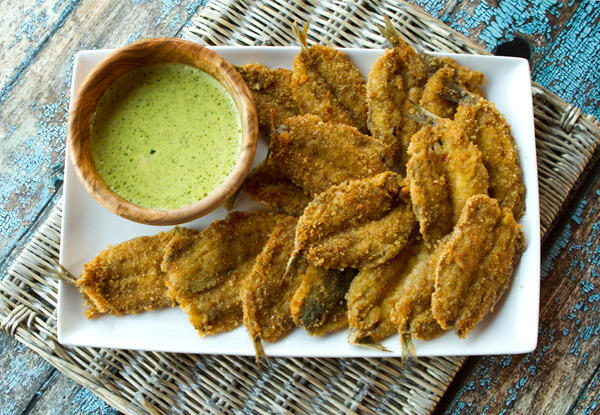 Place the flour in a plastic bag, then add two or three sardines at a time and shake until lightly coated. In a small bowl, beat the eggs with a tablespoon of water. One at a time, pass the sardines through the egg mixture first, then the breadcrumbs until coated. 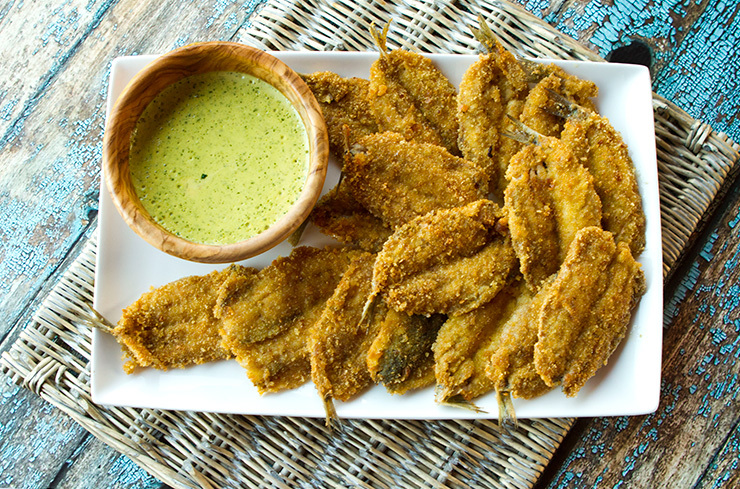 Place the breaded sardines on a tray. Continue until add of the sardines are coated. Heat the oil in a heavy frying pan, and over medium heat, fry as many sardines as will fit in one layer, until golden brown on one side, about 3 minutes. Carefully turn the sardines over, and fry on the other side. 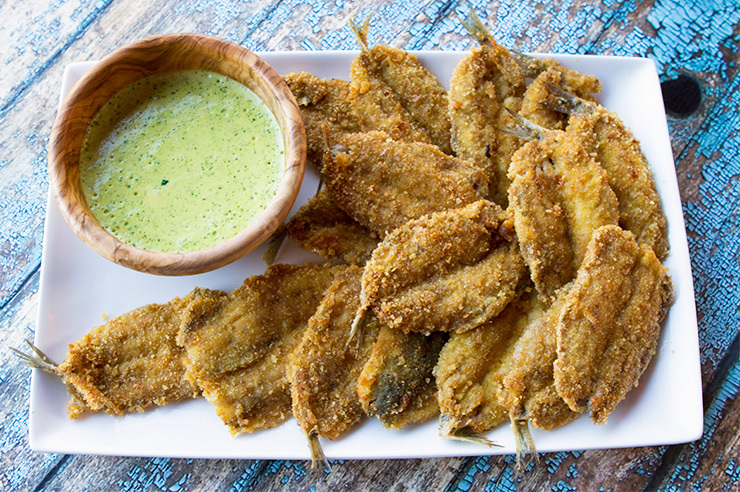 Place the fried sardines on paper towels and continue to cook all of the sardines. Place the sardines on a serving platter with the sauce and serve.